Mrs. Laura Bush delivers remarks during an Active Trails! event at Marsh-Billings-Rockefeller National Historical Park Monday, June 23, 2008, in Woodstock, Vt. Also shown are Rolf Diamant, Superintendent of Marsh-Billings-Rockefeller National Historical Park, and Vin Cipolla, President of the National Parks Foundation. 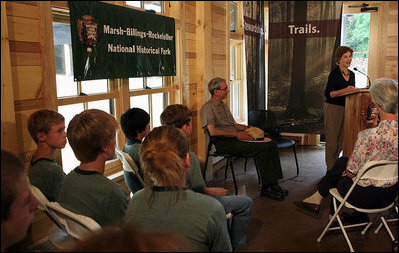 Mr. Cipolla just announced a $50, 000 grant from the National Park Foundation to the Marsh-Billings-Rockefeller National Historical Park to connect the Forest Center to the Woodstock Trails Network.